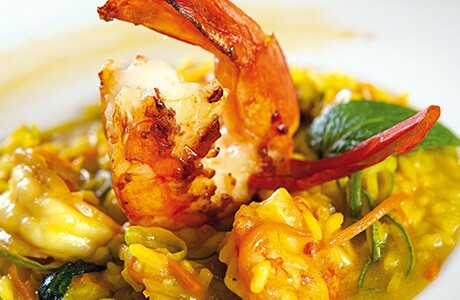 This seafood version of a classic risotto is typical of Venetian cuisine and the combination of prawns and fish stock, along with courgettes, gives an incredible depth of flavour. Making the sauce: Using a heavy bottomed saucepan sauté half the chopped onion in two tbs. of extra virgin olive oil until softened. Add prawns and cook. Add the glass of white wine and cook until it evaporates. Add the chopped courgettes and cook for a further 10-15 minutes. Making the risotto: Fry the other half of chopped onion in two tbs. extra virgin olive oil, add the rice and add some wine cooking until it has evaporated. Then add a ladleful of the boiling stock and simmer. As stock is absorbed add more stock when necessary. Continue in this way until the rice is cooked but still 'al dente' in the centre. Remove from heat, stir in a knob of butter and a little sauce. Leave for 2 minutes, then serve the risotto in a dish with prawns and cover with the remaining sauce.